1. This portable video projector is able to be connected to iPhone or other Android smartphone. To connect iPhone , the "iPhone to HDMI cable" is needed. To connect Android phone,fristly, please make sure if it supports the MHL function. Then perpare a MHL cable. 2. Please turn off the lights in your room when use to get best picture quality. 3. Not recommended for PPT, Word, Excel or other professional business presentations. 4. This projector can be installed on the ceilling,which could handle the placement hassle. 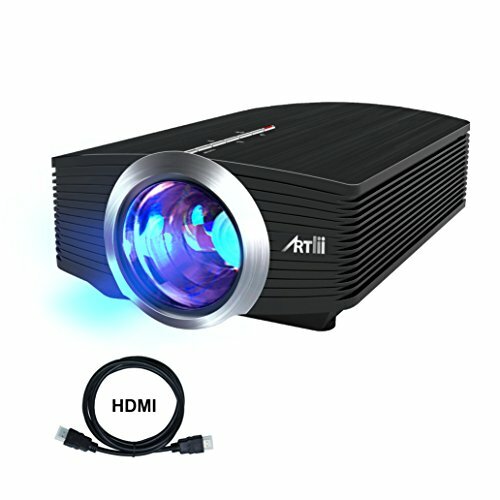 【Created for Home Entertainment】This Artlii projctor can be used for a variety of entertainment activities,like Watching movies, Showing photo album, Party playing, Playing video games, Enjoying football matches,etc. 【Refreshing and Comfortable Visual Experience】This movie projector have a big screen (130 inch ). Besides,it would provide you with bright and clear images. It will be great to bring you in films, movies, games, matches to the large screen to enjoy. 【Updated Stereo Audio More Powerful Sound】This home theater projector is equipped with a high level stereo speaker,which is able to provide powerful, loud, clear sound.It sounded really clear with good dynamics. 【Can Connect To All Major Streaming Media Devices】This projector is can connect to Fire TV Stick, Chromecast, DVD players, PC, Laptops, USB, TV, STB Players, TDT, Stereo, Camera, Speaker, iPhone, iPad, Macs, Android Smartphone, Tablets, PS4, PS3, XBOX, etc. Very versatile. 【3-YEAR WARRANTY】For any question, do not hesitate to contact our support. We will respond as soon as possible. If you have any questions about this product by ARTlii, contact us by completing and submitting the form below. If you are looking for a specif part number, please include it with your message.